While practicing their martial arts, Leonardo tells Splinter that he is convinced that there is one combat maneuver he has yet to teach the Turtles. Splinter ponders this for a moment and then agrees to teach him the one technique for which there is no defense, the Viper Maneuver. 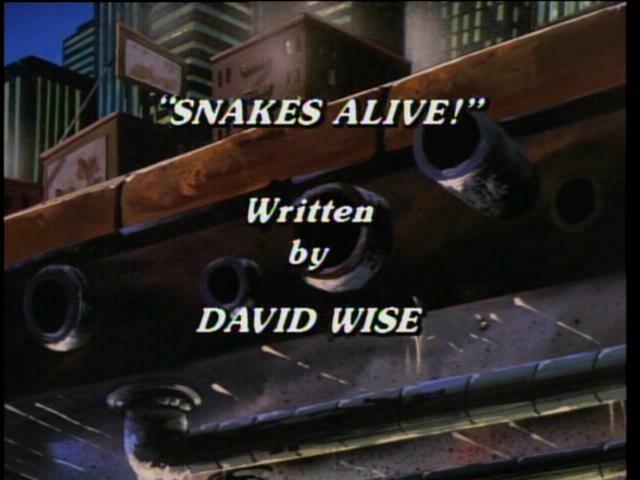 However, despite being Splinter’s most gifted pupil, the Viper Maneuver seems to be beyond Leonardo’s ability. Splinter suggests that maybe there is some hidden fear that prevents him from accomplishing the maneuver. Leonardo is insulted and quickly defends his honor by stating that he is not afraid of anything! Splinter informs Leonardo that he will not be able to perform the Viper Maneuver until he confronts his deepest, darkest fear and overcomes it. Meanwhile, April O’Neil reports on a break-in at the city zoo’s reptile house. It seems that someone made off with over six hundred species of snakes. Donatello, Raphael and Michaelangelo are very curious about this robbery while Leonardo seems to be visibly shaken by the mere mention of the word: snake. You don’t have to be a rocket scientist to know what Leonardo’s deepest darkest fear is. So, while prowling the streets looking for clues to the stolen snakes, the Turtles pass the Atlan-Tec Building and notice that all of the equipment inside is moving. Upon further investigation, they discover that the movement is being caused by hundred of snakes. Before, they all slither away, the Turtles are able to catch one, slip a tracking device on it and follow it to whoever has programmed them to steal. Meanwhile the other Turtles are curious about Leonardo’s strange behavior, but they have not made the connection to snakes. Across town, April and Vernon are cruising the streets, hot on the trail of the story when they come across Pinky McFingers and two of his henchmen breaking into a sporting goods store to steal scuba gear. Still on yet another side of town, the Turtles follow the snake with the tracking device onto the grounds of the old Botanical Gardens, which has been abandoned for years. 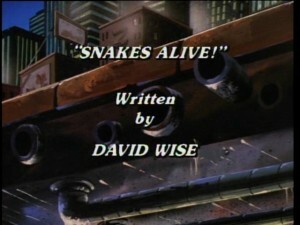 There the TMNT are attacked by hundreds of snakes. Leonardo panics and is unable to help the other Turtles. Before crashing through some rotting floorboards, Leonardo finally announces his fear of snakes. When Leonardo regains consciousness, the snakes and the other Turtles are gone. Leonardo is in a quandary. He knows that he must save the other Turtles, but his first reaction is to run which he does… straight into April and Vernon’s Channel Six News van, which had been following Pinky McFinger’s limo to the Old Botanical Gardens. While April and Leonardo exchange stories as to why whey are both there, inside McFingers delivers the stolen diving gear to a hooded figure known as Cobrato. Cobrato informs Pinky that he and his men are to use it to place a thermal device, built with all the stolen electrical equipment, at the bottom of the East River. Cobrato goes on to tell them that he plans to activate the device causing the water to rise in temperature and create a tropical atmosphere for his loyal subjects the snakes. Leonardo, April and Vernon follow Pinky McFingers and his henchmen to the river, capture him and turn him over to the police. But not before the villains are able to place Cobrato’s device at the bottom of the river. April does some research and learns that Cobrato is really Rudolph Cobrato, a herpetologist who disappeared after a tragic accident involving an experiment with snake venom. Meanwhile, convinced that his device is in place, Cobrato begins the activation process while Donatello, Michaelangelo and Raphael, convinced that Leonardo is too afraid of snakes to come back and rescue them, devise their own escape. All across the city, the temperature is rising, but still Leonardo is too afraid to go back and help his brothers, that is until three small children who worship the Turtles call him a chicken after he tells them that there is nothing he can do. Mustering up all of his courage, Leonardo successfully battles his way through the snakes, only to be confronted by the hooded Cobrato, who finally reveals himself to be a snake. Using the Viper Maneuver, Leonardo is able to defeat Cobrato, rescue the other Turtles, deactivate Cobrato’s device and even cause an ungrateful Cobrato to revert back to his human form.